Clarets boss Sean Dyche isn’t getting carried away after Burnley moved into the top half of the Premier League for the first time since November 2009. A stoppage time goal from Ashley Barnes gave the Clarets a 3-2 win over Crystal Palace at Turf Moor on Saturday, after Palace had come from 2-0 down to level matters. Burnley have taken seven points from the last available nine, beating Everton and holding Manchester United at Old Trafford, and have twice as many points as at this stage two seasons ago. Dyche is only looking at what lies ahead after the international break, with a televised trip to West Brom coming on Monday, November 21st. He said: “It feels like we’ve given ourselves a good base to work from, because we know it’s relentless. “The Premier League challenges you every game. “It’s to be enjoyed, but it’s not to be thought too deeply on as if there’s some kind of magic to it. “We know we’re going to have to play hard, and continue to learn and improve. 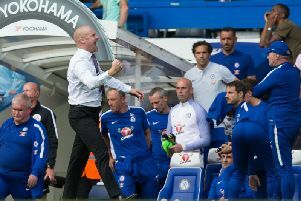 Thirteen of Burnley’s 14 points have come at home, and Dyche is enjoying the way his side are finding ways to win at this level, be it by playing on the counter attack or on the front foot, by playing direct, or good passing football: “We have made this a tough place to come, and one of the biggest things I’m intrigued by is finding different ways to win. “I don’t think you’ve heard me talk about brands very often, I want the team to be flexible and learn how to win games. “That’s where it starts for me, the outcome, winning. “At this level it’s more difficult. “We’ve got a good handle on what allows teams to win in the Championship, and in this division, it is quality - and that can be expensive - but it’s also the understanding of the team, and that has to change. “It’s been changing well over the weeks. “We didn’t expect to go to Man United and dominate. “We don’t expect to dominate any game, but we expect to have a format and framework that will work, a desire and quality to affect games, and we did that today. “Some of it is the market. “It’s the only division where money enhances it radically. “You’re looking at trying to get the next level of quality in, it’s very expensive and very tough. “You’ve also got to develop your players and I think we do that well here. “Theres a learning curve, but we’re watching it and that’s important - we can’t always cherry pick players who fit what we do. “Add all that into a tough level of football, and try and make it all work.